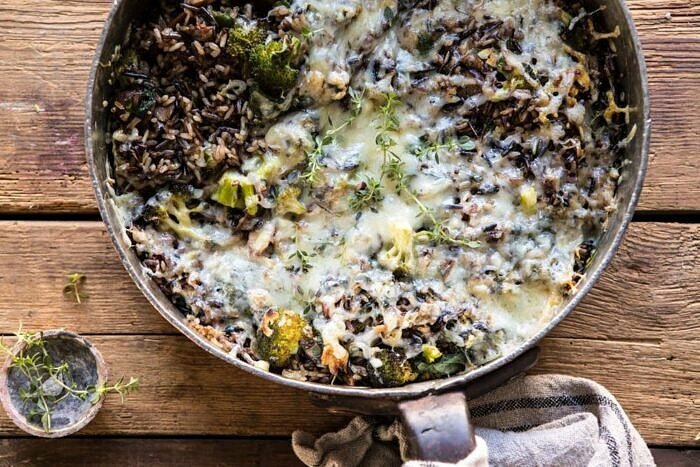 Keeping things healthy and cozy today with this one pan Broccoli Cheese Wild Rice Casserole. 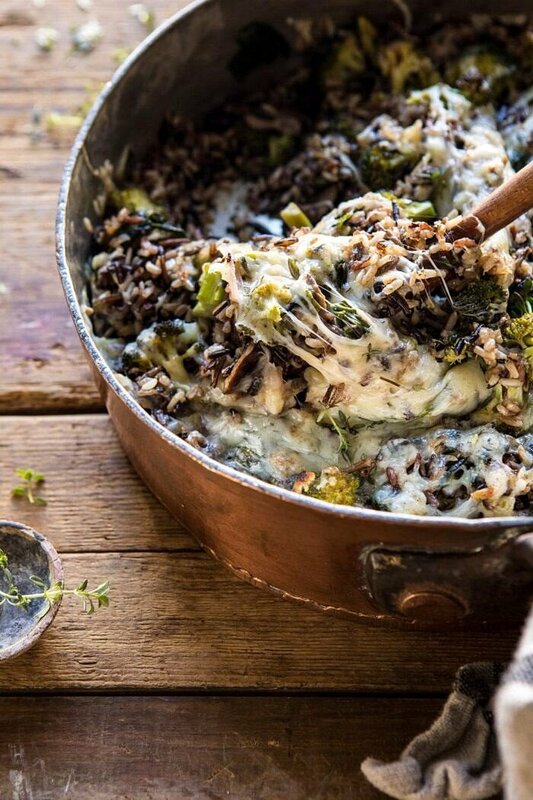 Roasted broccoli, fresh herbs, hearty wild rice, and plenty of melty cheese, all together in one casserole. This is equally great as a healthy vegetarian main course or as a side dish for your next holiday roast. Either way you serve it up, cheesy broccoli with rice is always a good combo! With the holidays here, it can be hard to sneak in vegetables between all the cheese filled appetizers, pasta dishes, and of course, all the holiday cookies. Trust me, I’m the first to admit that once November and December roll around, I go all out with recipes. I firmly believe we should allow ourselves to indulge in all the holiday food…and then go for a hike! That said, it’s also nice to have balance. In between all the pasta and cookies, some veggies and whole grains are needed too! I know to some this sounds boring, but I promise veggies can be just as delicious. This casserole is proof. I always cook so much wild rice during the months of November and December. It just feels so cozy to me. It reminds me of being a kid, and mom making her Sunday night rice pilaf that I loved so much. It’s one of those healthy foods that feels extra comforting, and I’m loving incorporating it into more dishes this year. One of the main requests I get, is for more vegetarian friendly recipes. I know so many of you are looking to cook more veggie heavy dinners. So I thought I’d share this casserole that my family loves so much. Growing up my dad used to make these rice bakes that consisted solely of rice, broccoli, cheese, and hard boiled eggs. It probably sounds really odd, but those cheesy rice bakes were delicious. They’re also the inspiration behind today’s recipe. I took his base idea and upgraded it a bit. The end result was this casserole. It’s quick, simple, a little bit retro (because I think all casseroles are kind of retro), healthy but cozy, and delicious. It’s hearty enough to be a full meal, but could also double as a simple veggie filled holiday side dish. Love a two in one kind of recipe! First things first, I always get a lot of questions about what wild rice brand I use. Personally, I like to use a wild rice blend to get a good mix of texture and flavor. This is my favorite wild rice blend. I’ve been ordering via Amazon…where I do 90% of my shopping…anyone else? But Thrive Market and a few other stores carry it as well. 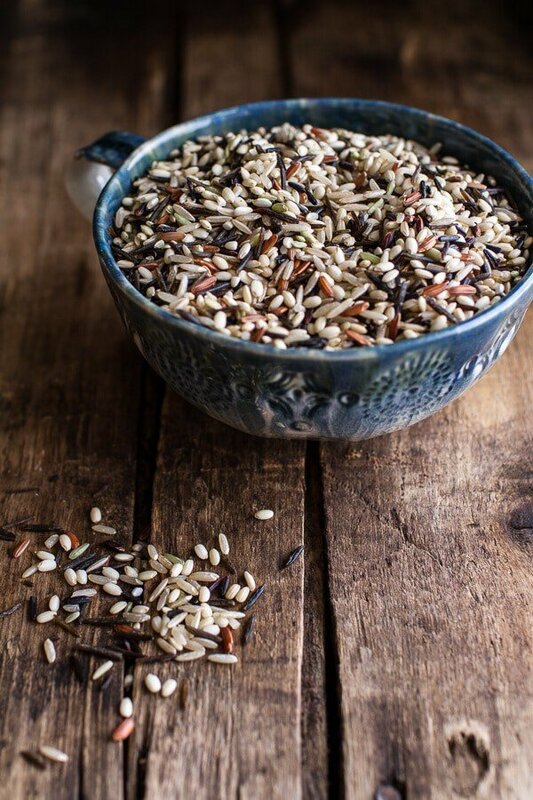 If wild rice is not easily available to you, I recommend using brown rice, but the cooking time might be a few minutes less as wild rice tends to take a touch longer to cook, so just be aware of that! Now, cook up the shallots along with some thinly sliced cremini mushrooms, some thyme, and a little dill. Add a few pats of butter, and let the wild rice toast up in the skillet. This step is KEY. Toasting the rice in the butter adds a nice nutty flavor to the rice that’s DELICIOUS. It’s a simple step that takes no time, but makes a big impact in the recipe. Don’t skip. Pour in some water, cover, and let the rice steam until fluffy. This takes a little bit of time. So…pour or mix-up a holiday cocktail, turn on the Christmas music, and relax a bit while this simmers away. When the rice is fluffy, stir in the broccoli and a couple handfuls of baby spinach (going heavy on the veggies today!). Then add lots of cheese, and transfer the dish to the oven to finish cooking. When the casserole comes out, the cheese will be bubbling, the edges will be crisp, and the smells coming from your kitchen will be beyond good. Finish off with a sprinkle of fresh thyme and you’ll have the perfect vegetarian dinner that’s both healthy and comforting. Trust me, I know this might not seem that special, but don’t knock it till you try it. Every bite is filled with nutty wild rice, crisp broccoli, and delicious Gruyère, because two is always better than one. 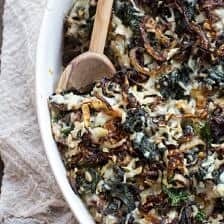 If you make this wild rice casserole be sure to leave a comment and/or give this recipe a rating! Above all, I love to hear from you guys and always do my best to respond to each and every comment. And of course, if you do make this recipe, don’t forget to also tag me on Instagram! Looking through the photos of recipes you all have made is my favorite! 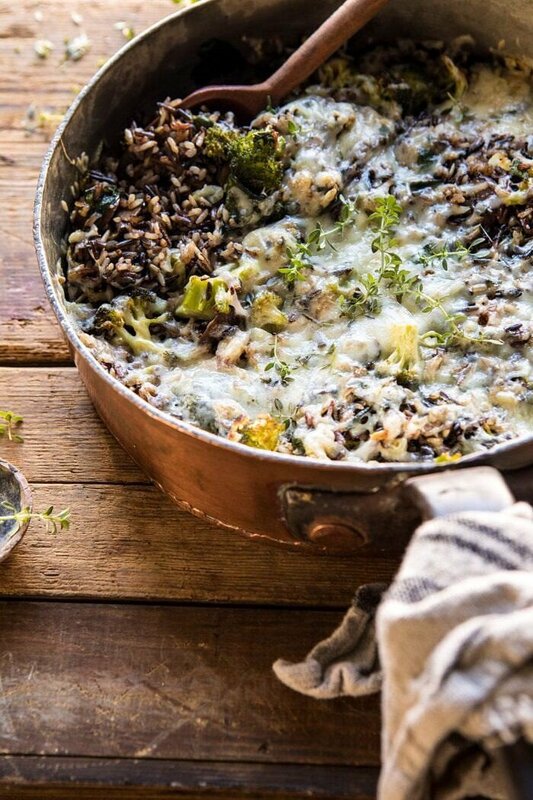 Roasted broccoli, fresh herbs, hearty wild rice, and plenty of melty cheese, all together in one pan. This is equally great as a healthy vegetarian main course or as a side dish for your next holiday roast! 2. Heat the olive oil In a large, oven safe skillet over medium heat. When the oil shimmers, add the shallots and cook until fragrant, about 2-3 minutes. Add the mushrooms, thyme, dill, crushed red pepper, and season with salt and pepper. Cook undisturbed for 5 minutes or until golden. Add the butter and wild rice, cook 2-3 minutes, until the rice is golden and toasted. Pour in 4 cups of water. Bring to a boil, cover and reduce heat to low. Cook, covered for 40-45 minutes. 3. Once the rice is cooked, stir in the broccoli, spinach, and 1/2 cup of each cheese. Season with salt and pepper. Scatter the remaining cheese over top the casserole. 4. Transfer to the oven and bake 20-25 minutes, until the cheese is melted and just beginning to brown. Serve warm with additional thyme. oh my, that rice looks really amazing!! Thank you so much Liz! I am so glad you like this! New reader here! This looks amazing!! I love your photographs, they are gorgeous. Welcome! I am so glad you are enjoying my blog, Andrea! Also, I hope you love all the recipes you try! This is such a great recipe! I’m making this tonight! I hope it turns out amazing for you, Marian! Thank you! Great recipe idea! My family eats a lot of meatless meals each week, so we will have to try this one. Was just adding Lundberg Wild Rice to my grocery list yesterday! Do you have a Walmart Super Center near? They have all the Lundberg rice and grain varieties at ours here on the Eastern Shore Maryland. 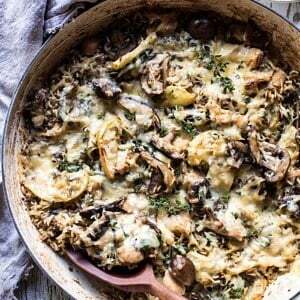 I think my family will like this dish….just minus the mushrooms for all three of them…maybe I’ll put some in my portion?! Happy last days of November to you! Hi Valerie! I hope your family loves this recipe! I do not have a Walmart Super Center, but I do have a regular Walmart near me! Thank you! This looks amazing and is just begging for some chickpeas or lentils added in to up the protein a bit. I can’t wait to try it! Thanks Tieghan! Thank you Dana! I hope you love this recipe! I’m thinking about making this soon, but since it’s just me, I anticipate a lot of leftovers. Is it possible to freeze this? Goes to my favorites list! 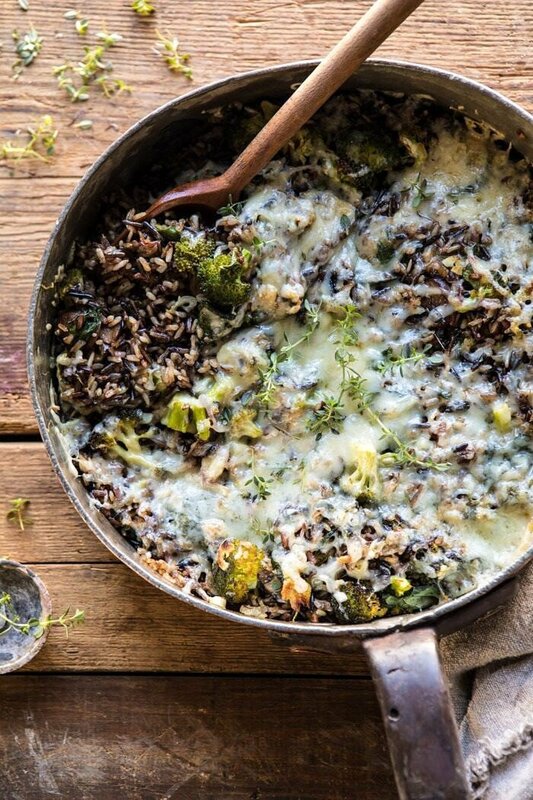 Always loved the broccoli & cheese combination, and wild rice is a perfect company! I mixed half white rice, so my 5 & 9 y.o. kids would also eat it, and it was a hit! Served with fish sticks, absolutely delicious! YUM! I am so glad you and your family loved this recipe, Anya! Thank you! 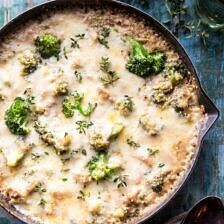 This broccoli cheese casserole is to die for! 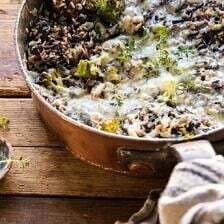 I am such a fan of wild rice in anything and flavors of your recipe look divine! Thanks so much for sharing. Thank you so much! I am so glad you like this recipe! It was DELICIOUS. The family loved it. Made a few substitutions: Vegetable stock vs water and added carrots and cauliflower as I did not have enough broccoli. Thanks and Happy December month. Thank you so much Karine! I am so glad you loved this! Thank you so much Alyssa! I am so glad this turned out amazing for you! Do you precook the broccoli or add it to the rice raw and have it cook in the oven? This was so yummy. I doubled the amount of broccoli (which made it hard to stir) but it turned out AMAZING once it cooked in the oven. I was really surprised at how delicious this was because it was so easy! YUM!! This was delicious. Thank you for a great recipe with a wonderful flavor combination. I love the Lundberg Rice products too. Hi Jeanne! Welcome to my blog, I am so glad you found it! Also, I am so glad you have been enjoying the recipes! Thank you so much! I made this for dinner tonight and my family loved it. Delicious! My husband wants me to add it to the Christmas menu. I am so glad this turned out so amazing for you, Gail! Thank you so much! Made this the other night and it was really delicious. One question – it refers to roasted broccoli, but I don’t see roasting the broccoli in the recipe. I went ahead and roasted ours since there was time while the rice cooks, but just wondering if that is the way it is meant to be or if the broccoli should go in raw? Loved this one too. Super easy and fast. Thank you! I am so glad this turned out so well for you! Thank you very much for this lovely recipe! I followed it as written except for one additional shallot, not quite a full eight ounces of mushrooms, vegetable broth instead of water. It was happily eaten by all members of family! Next time, I will sub parmesan for the Gruyere because I think we will enjoy that as well. I can’t wait to try some of your other recipes! Thank you again, Tieghan! Thank you for trying this! I am so happy you loved this! Made this last night in conjunction with your amazing Golden Sweet Potato Soup. Used 1 shallot, 1 small yellow onion, and a few big handfuls of baby kale, baby spinach & chard mix. Great way to use up random wild rice mix and veggies and cheese. Bonus- I mixed half and half leftovers of the sweet potato soup and this casserole today for lunch and it’s bangin!!!! My mind is playing tricks on me thinking the soup is actually cheesy sauce, which works so well with the broccoli. Thank you so much! Will for sure try this! Looks and sounds delicious. Can you tell me, please, I’m sure you’ve said it many times, but, what skillet you use?? Need to get one that can also go in oven. Or do you have a recommendation for a good multi-purpose stove-top and oven skillet/pot and size?! Thank you! Hi Cassandra! I use staub cast iron skillets! They’re linked in the shop page on my site! Made this for dinner last night and it was delicious! I added some shredded chicken to the mix when I added the broccoli. Thank you! The entire family (hubby and 3 kids) enjoyed it! Thank you so much Christa! I am so glad you loved this so much Laura! Thank you! Hi! So looking forward to making this! – it’s for my husband and he will want some protein so I’m going to add chicken – at what part in the recipe do you recommend it? should I pre-cook the chicken and then just add it in to heat for the oven phase? thank you! 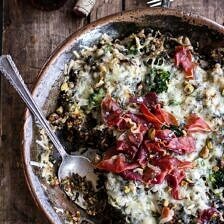 this is in the oven – can’t wait to try it, LOVE wild rice! Just wanted to double check the broccoli amount… 3 heads = approx 9 cups of broccoli… is that right? That how we made it and ours seems to be pretty broccoli heavy compared to your photos. Maybe we’ve misinterpreted a ‘head’ of broccoli? I’m sure it will be delicious either way it already smells amazing! Looking forward to making this tonight, it should be great with our Honeybaked ham. Christmas Eve dinner with family. I hope you have an amazing time and love this! Thank you Kathy! I made this for a Christmas side dish. Fabulous flavor. And yes the smells from the oven added to the excitement to try it. No vegetarians at the dinner so we used chicken broth instead of water. Nothing was leftover. I use many of your recipes and they are always delicious. Thanks so much for the recipe. Thank you so much Trish! I am so glad you loved this recipe! Could I use frozen broccoli? If so should I thaw it or put it in frozen? I love your cookbook and website! Big fan!! I need a take- along veggie for a trivia night. I’d like not to mess with spoons, forks, and bowls. I’m thinking this recipe might work to bake in muffin cups, what do you think? Delicious recipe!! I cut the recipe in half and love it. Indulgent and comforting, but still tons of veggies to keep it feeling healthy 🙂 thank you for another delicious vegetarian recipe!! Freezes well too. We made this again tonight…OMG, so yummy! This time, made it in a 7 1/4 dutch oven. Everything in the recipe plus 1/2 cup red lentils, one addtnl cup chicken broth, 2 diced zucchinis, most of a cooked chicken skin removed and shredded, more of each cheese. It was a huge pot of tasty goodness! Great recipe. I made it this week. My advice for people is to use vegetable stock instead of water to add more flavor. Also half the recipe because we had too many leftovers. It’s quite cheesy so maybell youll want it more as a side dish instead of the main dish. If you’re eating it as a main, maybe add sausage to appease any meat eaters. Great recipe. Gruyere made it a slam dunk.